Eurosatory is the largest international Defence and Security industry exhibition. It is held in Paris every two years. In 2018 the number of exhibitors rises to 1789, and 46 of them come from the Czech Republic, which also has one of 39 national pavilions. Besides the presenation of the Czech products and technologies, there are exhibitors who attract the Czech attention due to the current modernization tenders of the Czech Army, like the purchase of new Infantry Fighting Vehicles (IFVs). Eurosatory is the largest international Defence and Security industry exhibition. It is held in Paris every two years. The exhibition covers a wide range of land and air industry, and offers presenations of new vehicles (MBTs, armoured vehicles, carriers, trucks), small arms, communication systems, uniforms, logistic systems and other military and security technologies (training, maintenance). In 2016 exhibitors came from 57 countries and they were 1,571, and there was 57,024 visitors from 140 countries. In 2018 the number of exhibitors rises to 1789, and 46 of them come from the Czech Republic, which also has one of 39 national pavilions. Among the 46 Czech exhibitors the visitors may find Ceska Zbrojovka, Czechoslovak Group (CSG), Excalibur Army, Omnipol, Retia, STV Group, Tatra Export, VTÚ, and many others. Besides the presenation of the Czech products and technologies, there are exhibitors who attract the Czech attention due to the current modernization tenders of the Czech Army, like the purchase of new Infantry Fighting Vehicles (IFVs). This year's Eurosatory is exceptional for Excalibur Army, as during the ceremony on the first day of the fair, the company presented its brand-new logo and corporate image with the participation of important guests and representatives of the media and the public. Among the displayed products at the Excalibur Army stand there is the unique BM-21 MT 4x4 rocket launcher and the Patriot 4x4 Tactical APC armored vehicle (both built on a Tatra chassis by Tatra Trucks corporation), together with the lightweight UAV named ROC, unveiled at Eurosatory 2018. It is an autonomous remote-controlled drone in the form of a quadcopter, designed primarily for service in the armed forces, as well as the police and rescue services. The General Dynamics European Land Systems displays two variants of the ASCOD 2 Infantry Fighting Vehicle: the ASCOD 35 with the Elbit UT-30 Mk 2 turret mounted with a 30 mm cannon, and ASCOD 42 as a fire support vehicle with Leonardo Hitfact turret mounted with a 120 mm cannon. Both variants will be presented during the Bahna event and NATO Days in Ostrava in the Czech Republic. 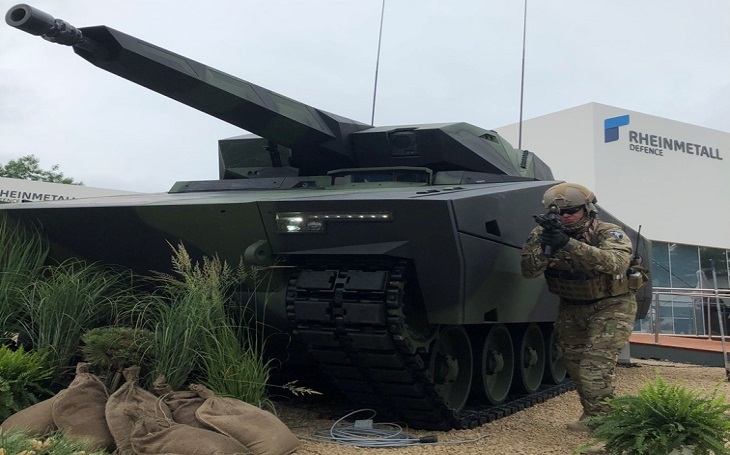 The German company Rheinmetall presents it’s brand new LYNX KF41 Infantry Fighting Vehicle, and as one of the eminent participants in the tender for purchase of new IFVs for the Czech Army the displayed vehicle carries the Czech Army camouflage.